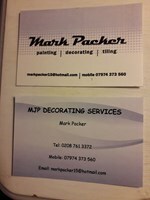 MJP Decorating Services - Painter/Decorator based in London, Greater London. Welcome to the Checkatrade page for Mark Packer (MJP Decorating Services). Based in Dulwich, South London I have been a self employed Painter & Decorator for the past 15 years. Fully qualified I have worked with the public throughout my career. I have done many jobs all over the country and always pride myself on offering an excellent service and professional top quality finish. I have a portfolio of work and many references available from satisfied customers and always provide a free written quotation for all jobs. You can call me on 07974 373 560 or alternatively e-mail me at [email protected] and I will respond promptly to discuss your requirements.